This week, I thought I’d share with you my system for storing miniatures figures; in this case, it’s my Clix collection, but conceivably you could store several types of miniatures in the system I’m going to show. It has completely changed the way I organize my miniatures, and definitely for the better! This translucent plastic sectioned tray is part of the Really Useful Products line. It is 8 3/4 inches wide, 11 inches long, and 2 1/2 inches deep; each of its 16 sections measures 2 1/4 inches wide, 2 3/4 inches long, and 2 1/2 inches deep. 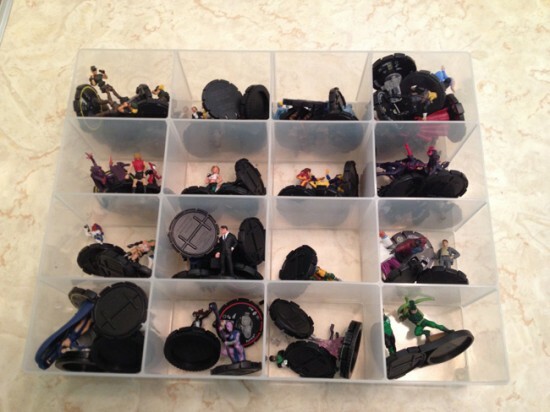 This is an example of how I use a tray to store Clix figures–this particular one holds all my team-support figures, and they are separated out according to type using the handy sections. For instance, all my Paramedics are in the top left section, while all of my combat-ready Probability Control figures are in the top right section, and so on. I find that the sections are big enough even to hold double-based figures, like the Green Lantern & Green Arrow piece stored at bottom right! The whole thing is translucent, so you can easily tell which figures are stored within on all sides. VERY handy for quickly picking out which tray you want to look at! The other great thing about this tray? Multiples of them stack really easily. 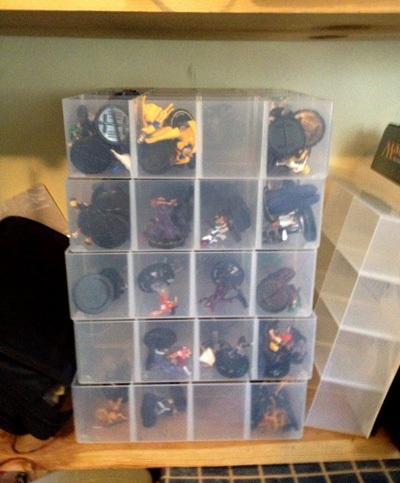 This is my entire Clix collection, stored in 5 of these style trays on a shelf in my closet. They are sturdy enough to stand up to being stacked, without being so heavy that they threaten the shelf’s stability. If you’re currently looking for a way to store minis at home, I would definitely recommend this kind of tray. Since I switched over to this system of storing my Clix, I find that I keep track of my collection easier, and find figures much more quickly. Plus, the figures don’t get damaged as easily, nor do they collect too much dust. The only caveat is that this system of trays is not very portable on its own, because they are open trays with no lids or handles. 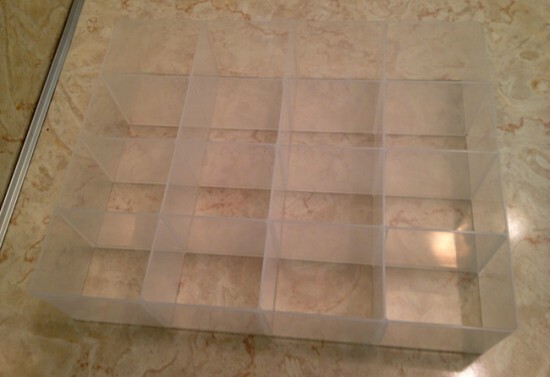 However, you can purchase boxes which hold several trays securely at one time (see below). This system’s modular functionality is the real winning ticket for me–we gamers need systems that easily expand to fit our growing collections! A couple of years ago, I finally dug into my massive collection of old hair and beauty products and purged about 80% of them. The collection that had once taken up two countertops, dozens of boxes in my closet, and several feet of floor space now fit nicely under the two bathroom cabinets and in a small five-drawer organizer sitting atop the cabinet. My makeup collection especially saw a big reduction. 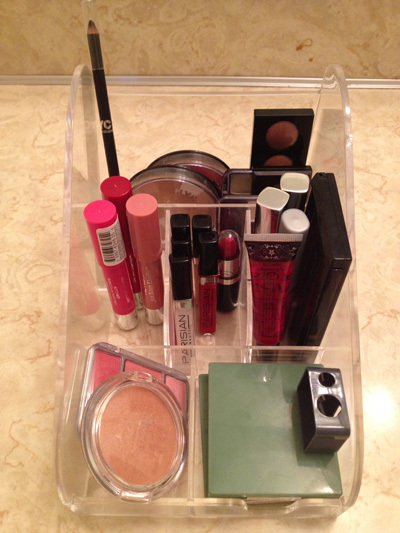 So much, in fact, that I only had to use two of the five tiny drawers in that organizer to store my makeup. I had to do something about this. I knew I wanted a more open storage system for my makeup, something that I didn’t have to open and close to get to…but I also wanted to be able to see everything in my collection without having to move other things out of the way. Plus, I didn’t want to spend a ton of money on whatever organizing system I got, just in case it didn’t work. It was a clear desktop organizer, meant for office supplies and the like. I, however, saw it a little differently. 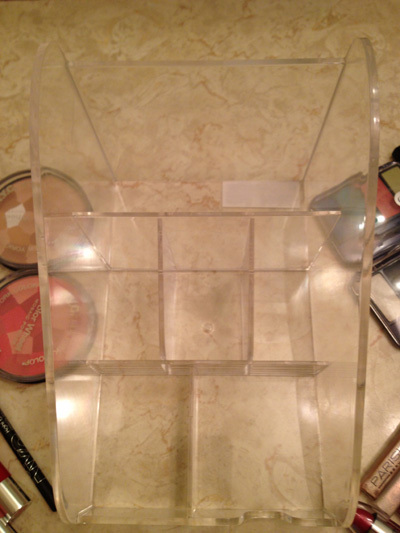 I bought it, brought it home, and within about 30 minutes, I had transformed my makeup organization space. 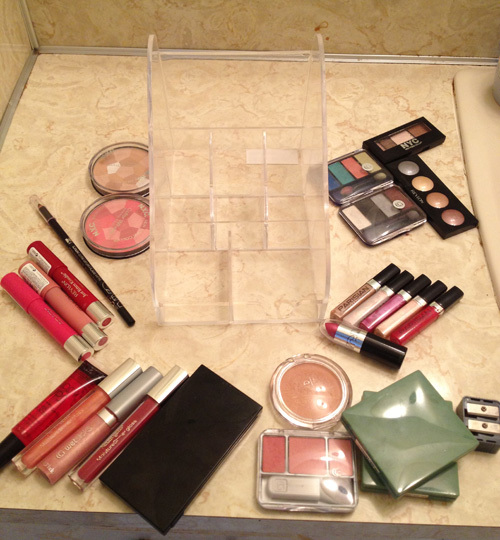 Yep, these are all the makeup products I own, and they all fit in this little desk organizer that takes up just under a square foot of space. Amazing, huh? 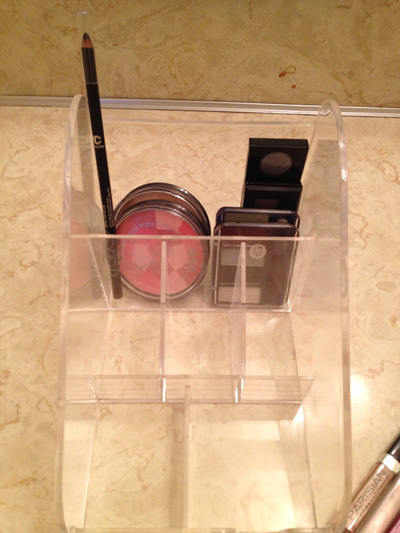 2: Use the very small but still high-walled compartments for items like lipsticks or other stick makeup that are best stored vertically. 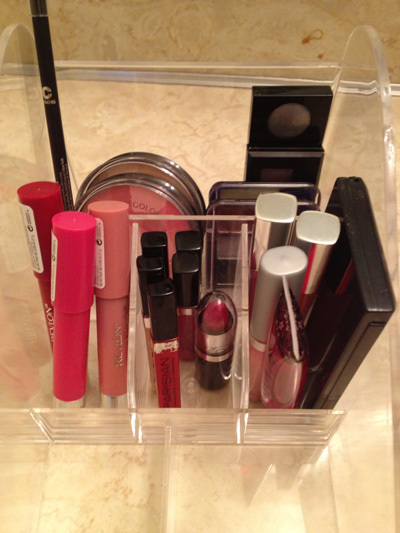 For me, this was key, because some of my glosses had begun to leak when stored horizontally; the vertical storage solves that issue! Tiny compartments also help keep the tiniest items from falling over, like those five tiny glosses in the middle compartment. 3: Use medium-sized, flatter compartments for smaller palettes or individual items–here, I’ve used them for blush, bronzer, face makeup, and even my sharpener because I feared the little thing would get lost otherwise. Also, be careful that your smaller palettes don’t get jammed down in the flatter compartments–I had to do some serious prying after my blush compact got stuck in the left compartment. That’s why it’s stored propped up the way it is! Now that I’ve had my makeup stored this way for about a month, I love it and wouldn’t go back. I can see every product and pull it out easily to use it, and more importantly, nothing gets ignored because the organizer is clear. 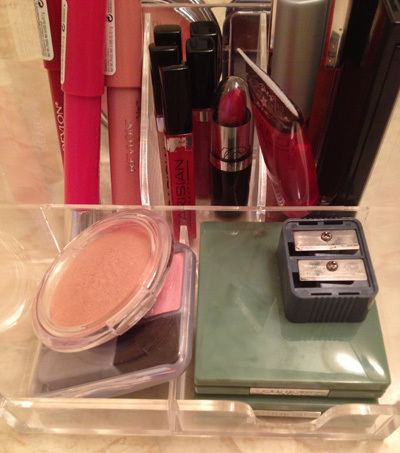 It makes getting ready a LOT easier–and all because I tuned into my repurposing radar. Neat!